The honeywisp family consists of only one known member – the eponymous Honeywisp. 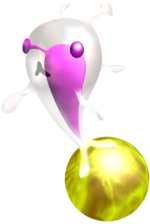 The Honeywisp is a gentle creature that merely floats in the air carrying either a blob of nectar (in Pikmin) or an egg (in Pikmin 2). It cannot harm Pikmin, but it can appear and disappear quite quickly. If a thrown Pikmin touches it, it instantly drops its nectar or egg and flies away. This page was last edited on February 7, 2015, at 13:27.